On November 9, Ms. Gherman and the UN Assistant Secretary-General for Political Affairs, Mr. Miroslav Jenca, had a meeting with President of the Republic of Uzbekistan, Mr. Shavkat Mirziyoyev. At the meeting, the President of Uzbekistan underscored productive cooperation of Uzbekistan with the United Nations and highlighted the initiatives of the country regarding constructive solutions to the security, stability and longstanding development issues in Central Asia. 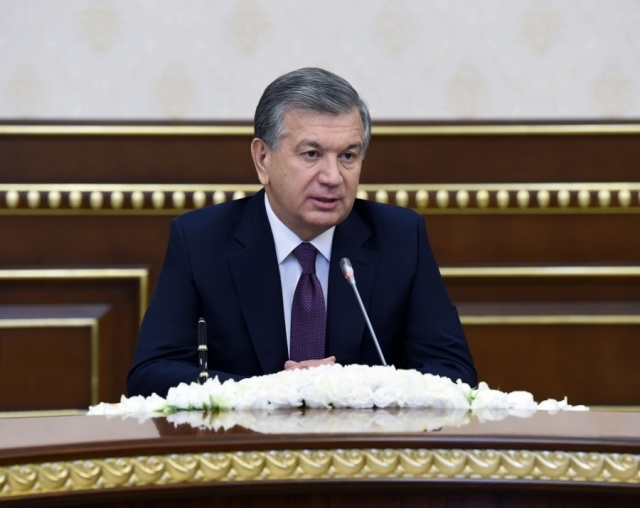 The President of Uzbekistan reiterated his utmost support to the Centre’s active engagement in facilitating and supporting five states of Central Asia in the field of counter-terrorism and extremism, transboundary water management, and cooperating with Afghanistan. During the visit, Ms. Gherman also met with First Deputy Chairman of the Senate of the Oliy Majlis of the Republic of Uzbekistan, Mr. Sodiq Safoyev, Minister of Foreign Affairs, Mr. Abdulaziz Kamilov, Deputy Minister of Agriculture and Water Resources, Mr. Shavkat Khamraev to exchange views on the developments in Central Asia, cooperation on security and regional stability, collaboration with the Regional Center on implementing preventive initiatives in the region. During the visit, Ms. Gherman also attended the International Conference on Security and Sustainable Development in Central Asia “Central Asia: Shared Past and Common Future, Cooperation for Sustainable Development and Mutual Prosperity​” organized under the auspices of the United Nations in Samarkand. On the margins of the Conference, SRSG Gherman had meetings with OSCE Secretary General, Mr. Thomas Greminger, SCO Secretary-General, Mr. Rashid Alimov, EU Special Representative for Central Asia, Mr. Peter Burian, Deputy State Secretary (Minister) of Foreign Affairs of Switzerland, Ms. Krystyna Marty Lang, State Secretary of the Ministry of Foreign Affairs of Latvia, Mr. Andrejs Pildegovics, Extraordinary and Plenipotentiary Ambassador of Sweden to Uzbekistan, Ms. Ingrid Tersman, and with other officials.